Oil on panel, 55 x 67 cm. A small group of people is gathered inside the dim tavern. A peasant, a soldier lifting his glass, and a plump, young woman dressed in a green tunic lined with fur are seated around the table. Next to the table stands the proprietress with heavy, drooping shoulders, accepting money from a stout peasant with a hen in a cage slung over his shoulder. The plump figures with large heads and small, expressive faces are characteristic of Jan Steen’s genre paintings with subjects from domestic interiors or inn and tavern scenes such as this one. The work is highly realistic in its rich details, such as the depiction of the glass and the glass bottle, the spoon, pipe and the violin on the wall behind the figures. 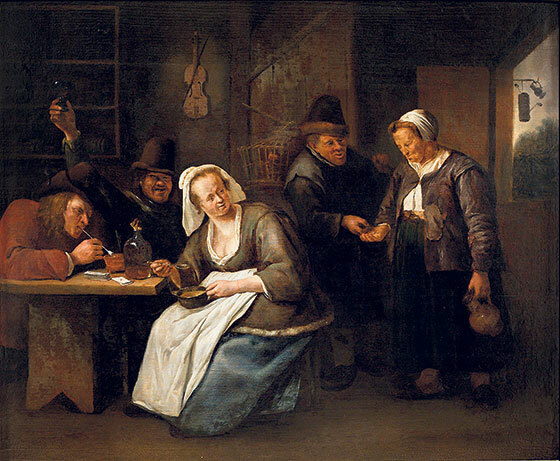 On the wall over the peasant with the hen, the artist has signed the painting “Steen”.